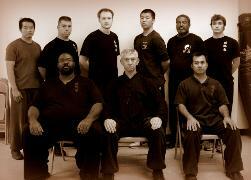 Grant’s Kung Fu Academy offers kung fu classes in Delaware county. 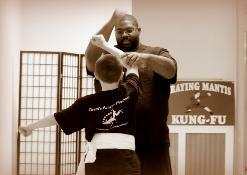 We specialize in several Martial Art and Personal Defense Systems: Northern Praying Mantis, Wing Chun, Gao Style Baguazhang, Hebei Style Xingyiquan, Tactical Flashlight Defense, Personal Defense, and Firearms training. Our training blends the ancient Chinese Martial Arts techniques with todays need for fitness, conditioning and character building. All students are encouraged to ask questions, observe other styles, learn theory, and apply it to real life. Every student of our school will become an “Academic Martial Artist” understanding why and how to use the techniques they learn. We encourage our students to always ask questions, observe other styles, not just to learn theory but apply it to real life. We want our students to be the best, and to be “Academic Martial Artists” and understand why and how the techniques are used. Our martial program develops each and every muscle, bones, and tendons in your body, building greater strength and health. Develop proper body conditioning in a fun safe way. You will quickly notice an overall improvement in endurance, muscle development, and flexibility. Along with physical improvement you will also develop total concentration, focusing only on the present for optimal performance. Relearning how to center your mind to be aware of self and your environment. You will also relearn how to breathe, developing “breath control”, so that tiring activities will seem effortless and your “chi”, internal energy, will force circulation, strength, and balance. In our adult classes, 13 years and above, you will learn lineage forms, traditional weapons, and the ability to defend yourself all ranges of combat from up-close to the ground. We also teach San Da, Shuai Jiao, and Lei Tai, which helps students learn proper response to emergency situations. In this class, 6-12 years old, children will learn lineage forms and sparring. Also there is an emphasis on respect for parents & teachers, guidance on setting and achieving goals, training to say ‘NO’ to unhealthy peer pressure, and instructions on real life emergency situations. Kids also are encouraged to compete in national competitions. In this class, ages 3-5 years old, have fun learning balance, coordination, discipline, & self-control with this specialized program. 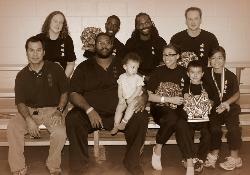 Gradually, learn the basics of Kung Fu & when they complete the basics, they advance to our Children’s program. Feel safe when you’re alone. In this class, learn the essential techniques that will defend themselves from any would be attackers. Learn the right and safe way to protect yourself and build the self-confidence and courage in different type of scenarios all while in a safe environment. Learn how to use non- lethal techniques or learn how to use your firearm safely and in a controlled manner.